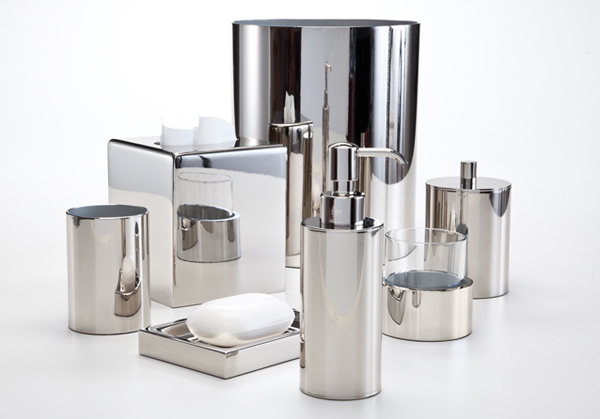 Time and again, we love a good bathroom set – either for gifts but especially for our personal use at home or even in hotels wherein we stay in during travels. 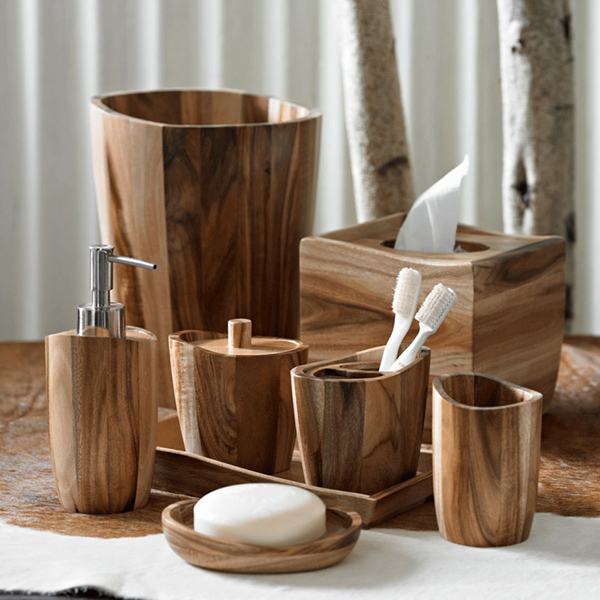 We already have a list here in Home Design Lover about bathroom accessories that you can readily see online for purchases; today is not like any other day because this is list surely will encourage you to get one; I know I did. 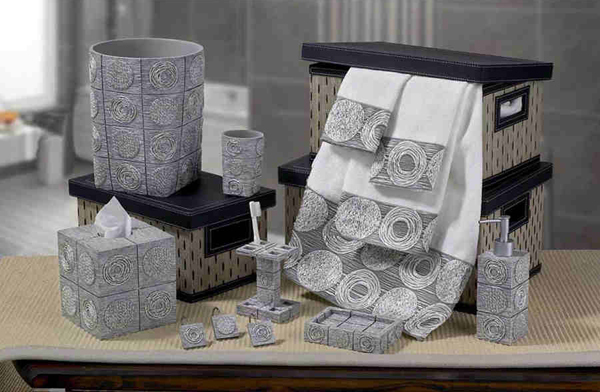 Below is a list of 20 Charming Complete Bathroom Set that are not only pretty and have unique designs and materials, but also a wonderful effect when used at your own bathroom. I’m sure we do not have to buy all things in tandem or matchy-matchy, but sometimes they just look really good, you want more. Check out the wonderful designs below guys. This collection looks cute with all the spherical legs on them. Knock on wood. 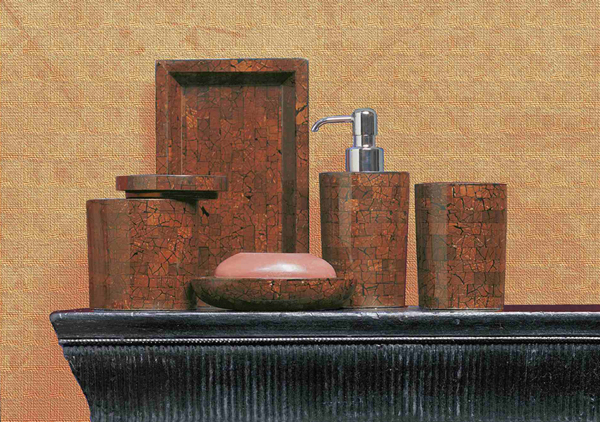 Crafted of beautiful acacia wood, the Acacia Bath Accessories Collection from Kassatex brings a look of rustic charm to any bath space. I know one shoe named Bianca that looked just as lovely as this one! 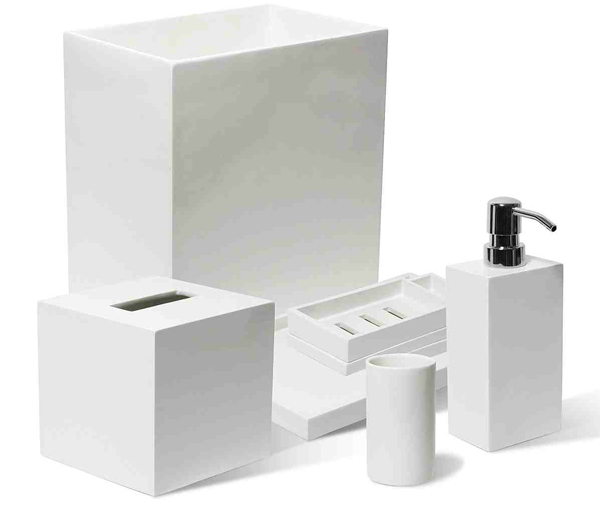 A timeless look that never goes out of style, this Century bath accessories collection from Hotel Collection features cool, white porcelain with wood accents for a simple yet elegant feel. This set does not really look like cement for me, but the lines seen on the sides and angles of this collection sure is interesting. 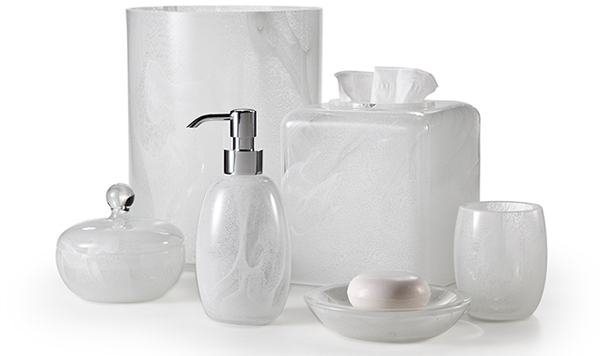 Refresh and renew with sleek Crackle Glass bath accessories. Crackle glass creates a mod texture and look while brass-based metal with a shiny nickel finish creates clean lines. 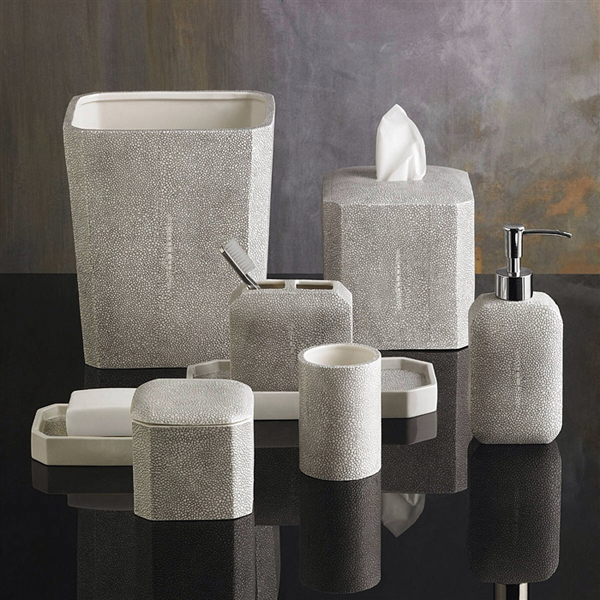 Black sure is classy and out of this world because of the texture of this bath collection. Cosmic chic. 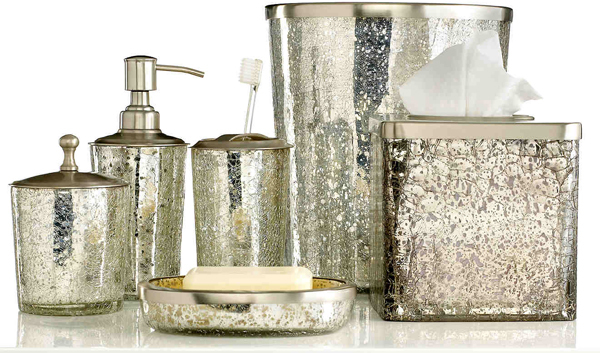 This Galaxy bath accessories collection from Avanti is totally out of this world, featuring intricate planetary shapes in shimmering metallic silver hues. Crafted of hand-painted resin. 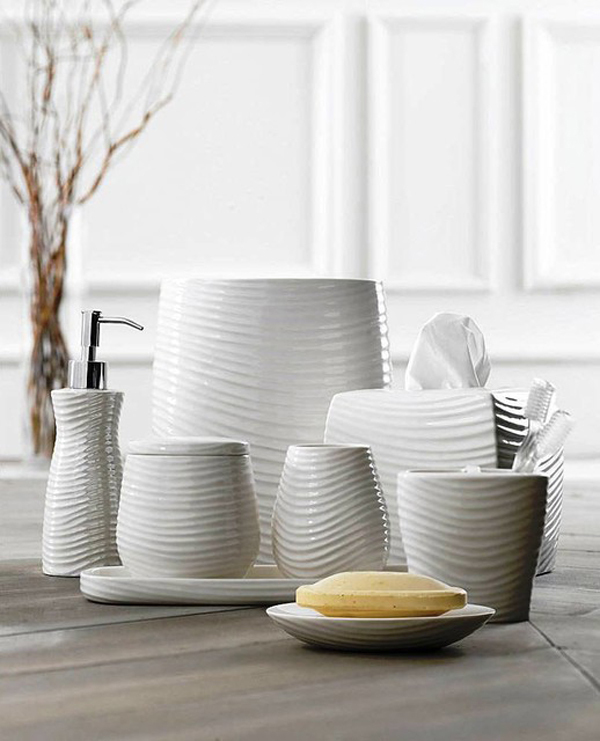 Like the feel of elaborate white bathroom set in my personal space – seems rather clean and expensive. 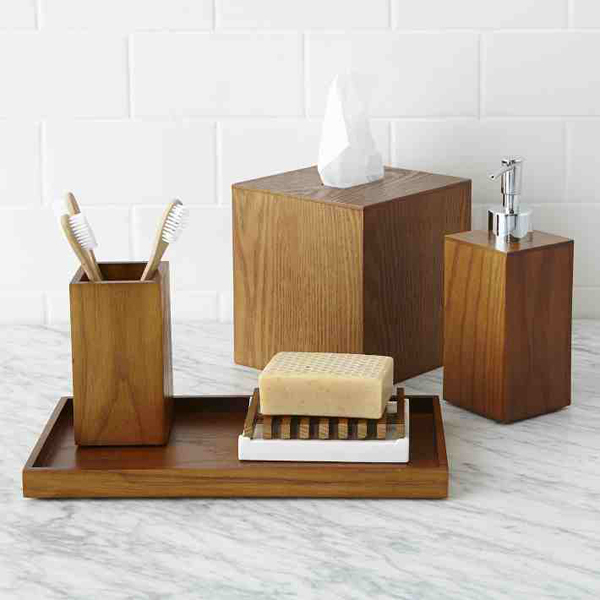 Outfit your bathroom in contemporary style with these bath accessories from Jonathan Adler, crafted of wood with a hand poured lacquer finish for a smooth and sleek appeal. 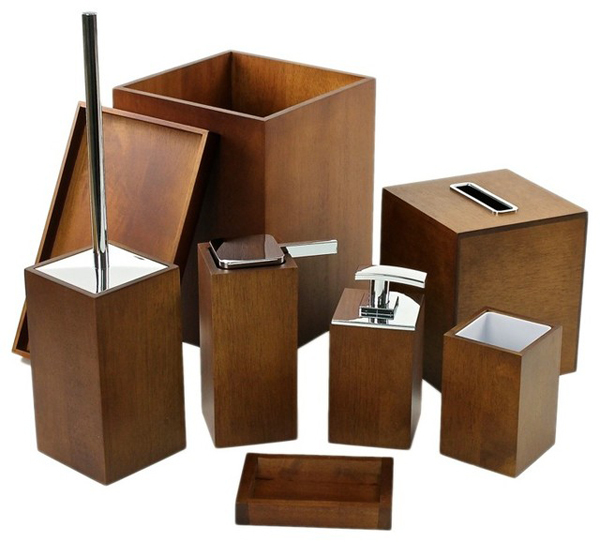 This loft bathroom accessories is modern and sleek with its wooden material and class. 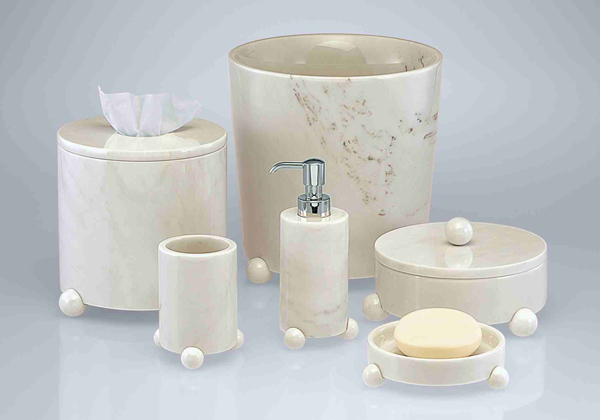 Beautify your bath space with the Madeline accessories collection from Kassatex. 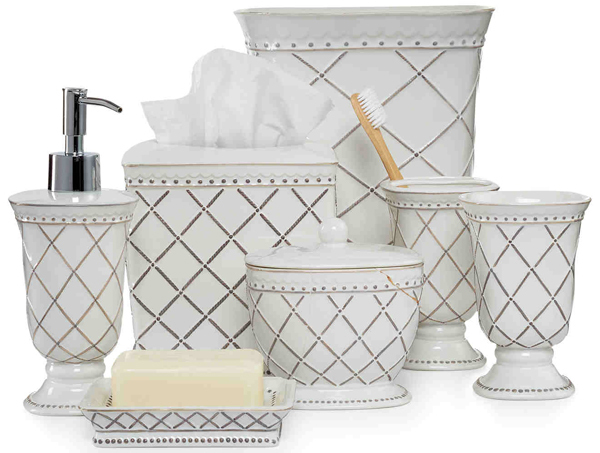 Each piece features ornate detailing and an embossed criss-cross design on white porcelain. 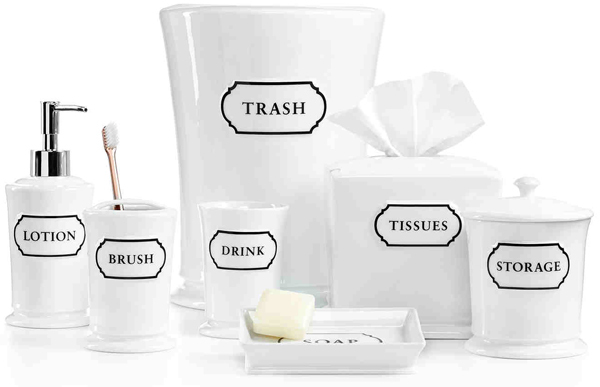 Simple and classy, the Words Bath Accessories Collection is crafted of beautiful white porcelain with framed words depicting what each item is used for. Luminous beauty. 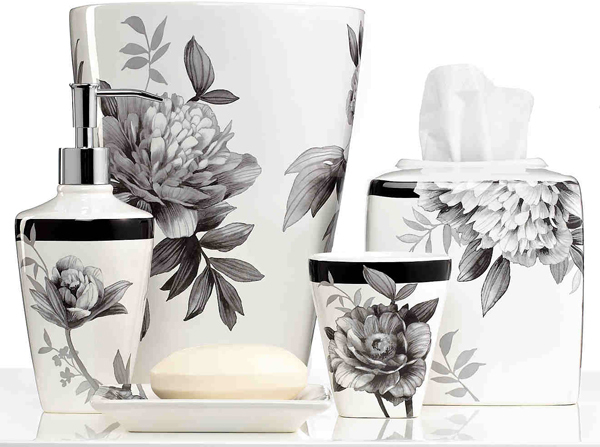 This Moonlit Garden bath accessories collection from Lenox brings modern romance to your bath space with sophisticated florals in soft charcoal and black hues. Turn your bathroom into a palace with this Argento bath collection from Labrazel, featuring a black tile finish for a classic look. 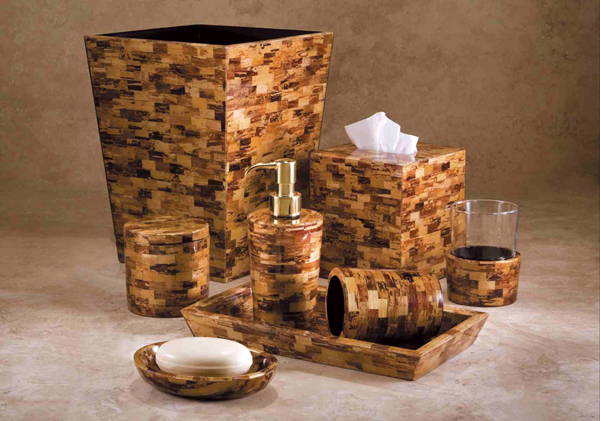 What do you think about this fancy-looking bathroom set? Very modern and shiny. I’m not sure if this is a bit heavier than most of the bathroom accessories in this list but it sure is beautiful. 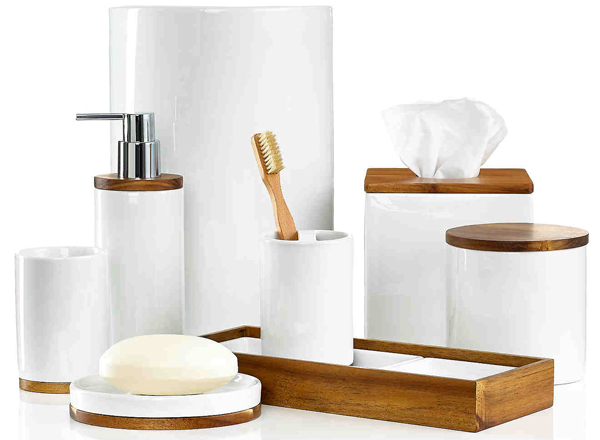 This 8-piece bathroom accessory set includes all your bathroom needs. 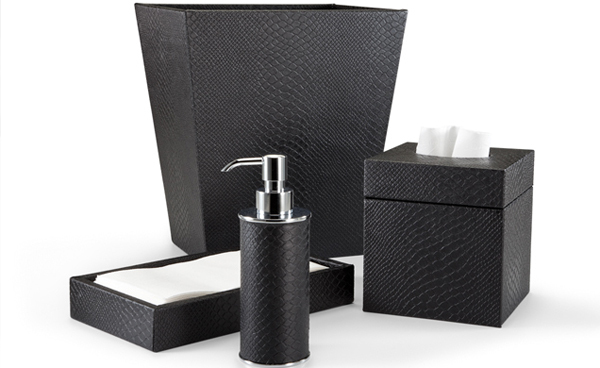 Set includes 2 different soap dispensers, toothbrush holder, tray, toilet brush, soap dish, waste bin, and a boutique tissue box cover. Set is made of wedge finished wood. 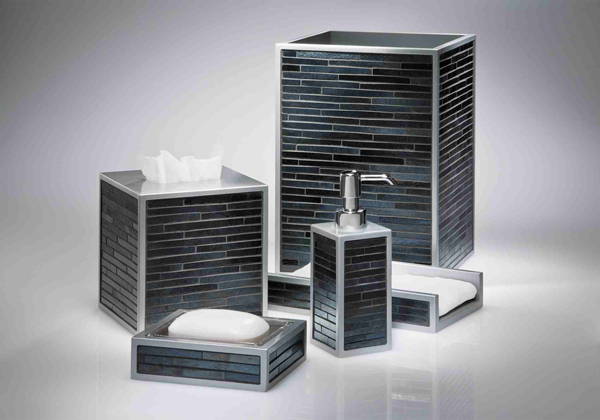 I like the sleek lines created in the body of this bathroom set, don’t you? 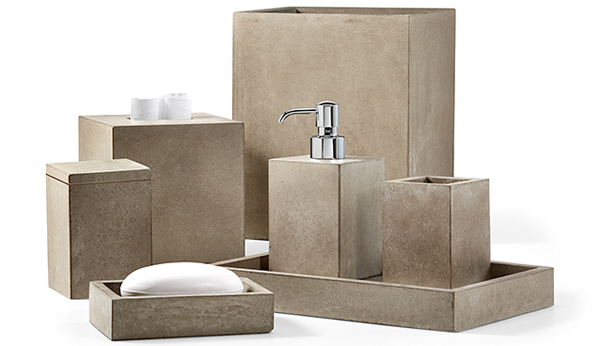 This bathroom accessory set is made of ceramic with the coco shell as the inspiration. That was indeed a wonderful list to check out, don’t you just think guys? Even other vanity sets look fascinating and interesting. Both these lists create a feel of envy in my skin because there are some favorites in this list that I actually get for my own house. Haha! More to come in Home Design Lover!